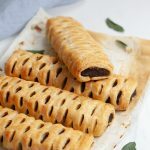 So, there’s been a lot of hype here in the UK about Greggs bringing out a vegan sausage roll. And what with Piers Morgan almost refusing to eat it on national telly and calling it ‘disgusting’, it has become one of the most talked about topics of 2019. We’ll take that as a win. But we all know nothing beats a proper homemade version. 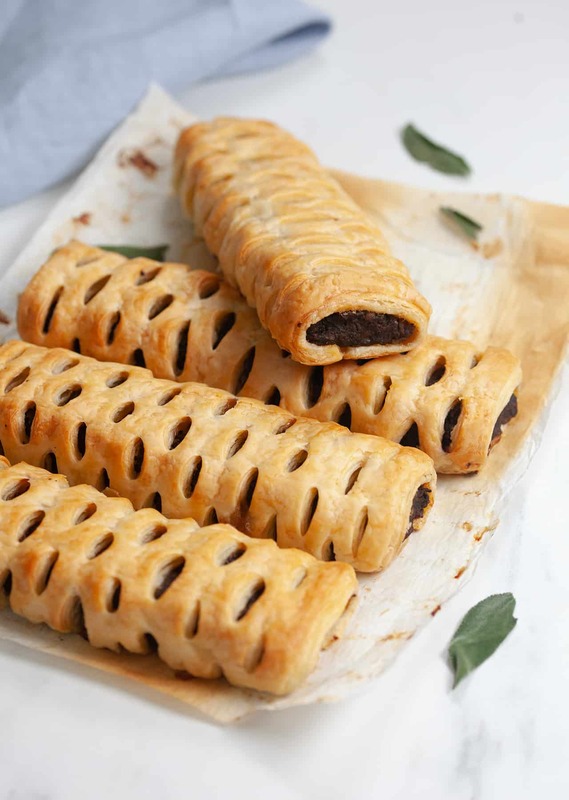 So we decided to create our own vegan sausage roll using the winning combination of mushrooms, onion and sage, as well as a few of our favourite vegan sausages thrown in for good measure. Oh and Piers, this one’s for you…our debut 5-ingredient cookbook So Vegan in 5, which is out right now. Defrost the vegan sausages if you haven’t already. Roughly chop the mushrooms and add them to a food processor. Process until mostly broken down. Peel and roughly chop the onions, then add them to the processor along with the defrosted vegan sausages, sage leaves and a pinch of salt and pepper. Process until all the ingredients have mostly broken down and only a few larger pieces remain. Heat a frying pan on a medium heat. Once hot, transfer the mushroom mixture to the pan and fry for 30 minutes, or until almost all of the moisture has evaporated, stirring frequently to prevent the mixture sticking to the pan. Remove the mushroom mixture from the heat and transfer to a plate. Leave to cool completely. Tip: if it’s cold outside, we leave the mushroom mixture outdoors so it cools quicker. 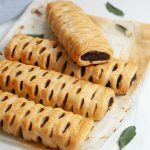 Meanwhile, either line a large baking tray with baking paper or (if the pastry already comes wrapped in a sheet of baking paper) roll out the sheet of pastry onto the tray and cut the pastry in half both lengthways and widthways to create 4 equal-sized pieces of pastry. To create the lattice effect, start by making small incisions along the top and bottom edges of each pastry square at 2cm intervals. Note: the top and bottom incisions need to line up. Where there is an incision, make two more incisions directly vertically below (one below the other) roughly 2.5cm long each. Between the incisions, make three vertical cuts into the pastry (2.5cm long each). Repeat steps 5 and 6 for all pastry rectangles. Tip: watch the video to if you’re unsure! Preheat the oven to 180°C / 356°F fan-assisted. Spoon a quarter of the mushroom mixture along the length of each rectangle of pastry and shape the mixture into a log. 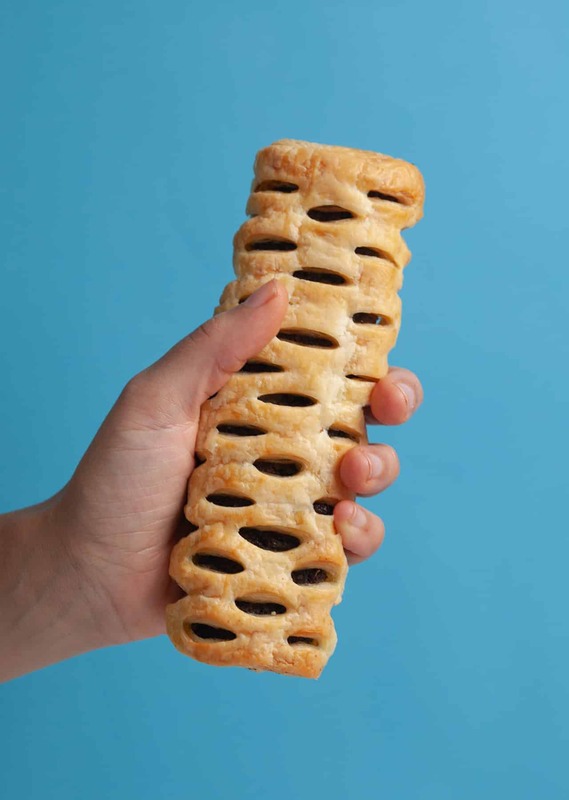 Seal the pastry by wrapping the ends around the mixture and pinching the ends together. Then turn the sausage rolls upside down so where the pastry joins is on the bottom. Brush the sausage rolls with olive oil and bake for 40-45 minutes until golden brown. Enjoy!